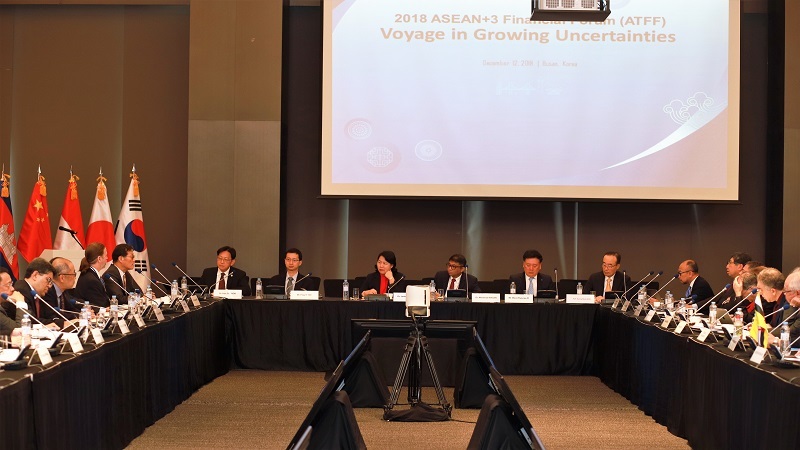 The 3rd ASEAN+3 Financial Forum (ATFF) with the theme of “Voyage in Growing Uncertainties” will be held back to back with the ASEAN+3 Finance and Central Bank Deputies’ Meeting (AFCDM+3) in Busan, Korea, on December 12, 2018. Hosted by the ASEAN+3 Macroeconomic Research Office (AMRO), the full-day program will focus on how ASEAN+3 members continue to sustain growth and stability in the face of growing uncertainties, including the global trade issues and tightening financial conditions. In this context, the forum will also discuss the future of ASEAN+3 regional financial cooperation, with a focus on enhancing the regional financing arrangement – the Chiang Mai Initiative Multilateralisation (CMIM) – and its contribution to the global financial safety net. Speakers and discussants include high-level policy makers, renowned academics and economists who have strong background and experience on both regional and global issues. AMRO Director Dr. Junhong Chang will deliver welcome remarks. In their capacity as the Co-chairs of AMRO Executive Committee in 2018, Mr. Weon-Kyoung JO, Director General for G20, IMF and ASEAN+3, International Finance Bureau, Ministry of Economy and Finance, Korea, and Mr Ping Yi Yee, Deputy Secretary (Planning) of Ministry of Finance of Singapore, will deliver keynote addresses at the forum. 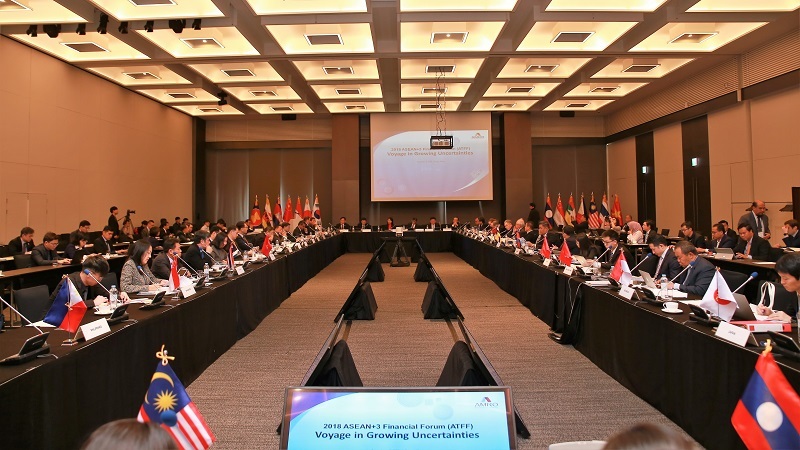 Inaugurated in 2016, the ATFF acts as a flagship platform for ASEAN+3 Deputies, academics and high-level representatives of international financial institutions to brainstorm on major issues related to regional economic and financial cooperation. 10:15 am-12:15 pm The ASEAN+3 region is currently the fastest growing and amongst the most dynamic regions in the world. However, the economic outlook is clouded by near-term challenges of trade protectionism and tightening financial conditions. U.S. trade protectionist actions targeted at China have adversely affected the whole region through effects on global value chains and investment prospects and shaken the multilateral rules-based trading system. At the same time, tightening global financial conditions led by U.S. monetary policy normalisation will narrow the policy space for regional economies. In addition to these external challenges, economies face ongoing domestic structural challenges. These include reskilling the labor force and creating employment in the face of challenges posed by automation and digital technology for both developed and developing economies; and moving up the economic value chain and technology ladder for middle-income economies. • How can the region best cooperate to respond to U.S. trade protectionism and to preserve the multilateral rules-based trading system? • With tightening global financial conditions, how can policymakers best use the shrinking policy space to maintain financial stability? • How can policy best support the adjustment in our economies to disruptive changes brought about by digital technology and automation? Luncheon Speech: Lunchtable Economics on Financial Crisis: Are we ready to face another financial crisis? 13:30 pm-15:30 pm During the last decade, ASEAN+3 members have put concerted efforts to improve the size, scope, and capabilities of CMIM to support financial stability of this region; while CMIM is firmly in a position that is supportive of the global financial system. Still, alarm bells have been sounding for this region as well as some countries in other region in 2018. The uncertainties persist out of the fallout from US Fed’s rate hike, trade war and turbulent capital market. We have such ever-present concerns of financial crises mainly in the context of rising capital flows – the risk of incidence of sudden stops and the amount of output losses have not changed greatly since 1990s up to now. This has been precipitated by the heightened financial interconnectedness, which has increased the likelihood of risks being transmitted into domestic economies, e.g. through excessive credit growth. There is no substitute for a strong financial safety net to support for financial stability in the region. In this session, we would like to brainstorm about the future of Regional Financial Cooperation in the region, while focussing on possible evolution path of the CMIM in the future, as well as promoting local currency usage in the region. Possibly, we can also discuss coordination among ASEAN+3 initiatives, and expansion of their scope. Ladies and gentlemen – Good morning. 1. I am honored to welcome you to AMRO’s ASEAN+3 Financial Forum, or ATFF, held back to back with the ASEAN+3 Finance and Central Bank Deputies’ Meeting here in Busan. 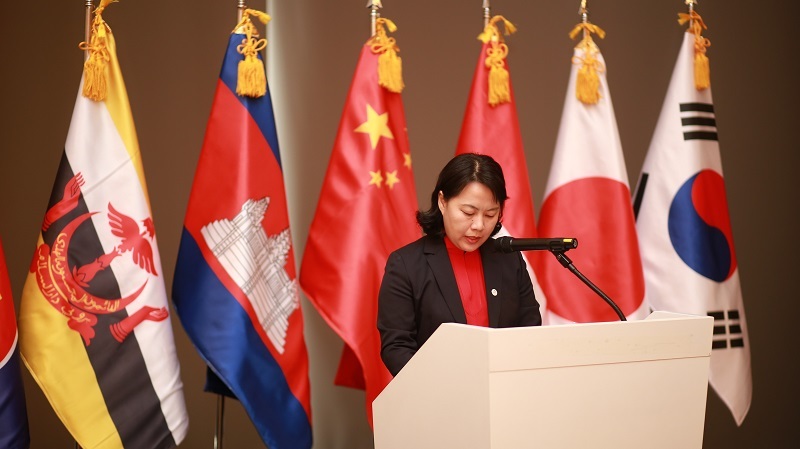 Today’s event marks the third year running of the ATFF, which provides a regular platform for ASEAN+3 Deputies, academics and high-level representatives from international financial institutions and other multilateral organisations to exchange views on pertinent global and regional issues. Since our inaugural ATFF in Guiyang, China in 2016, the discussions have been lively and thought provoking. Encouraged by this positive development, we have decided to turn this ATFF into a full day event. Once again, I wish to welcome all of you, especially to our guests joining us for the very first time. 3. Let me share with you some thoughts on these issues. 4. First, on the global economy. The synchronous character of the global expansion has been largely sustained this year, driven by the strengthening of global capex and the tech upcycle. Amongst major G3 economies (U.S., Eurozone and Japan), the U.S. is clearly the strongest, boosted in part by a large fiscal stimulus package. The confluence of these favorable external demand drivers have helped to support global trade, which has in turn benefited the region. Estimates by AMRO showed that exports have contributed 30 to 45 percent share of the region’s growth in 2018. Looking ahead in 2019 however, the picture is less rosy. 5. This brings me to my second point, on the outlook of the U.S. economy. As we know, the current economic expansion in the U.S. is one of the longest on record. This has led to important questions, which are when the downturn will come and how we can prepare for it. This concern, which has been exacerbated by the heightened trade tension with China, is partly responsible for the recent selloff in Wall Street and around the world. 6. Third, on the near term regional outlook. The ASEAN+3 region has been doing well, and remains the fastest growing region in the world. Most economies are growing at close to, or slightly above potential with benign inflation. However, the near term outlook is clouded by growing uncertainties over the future of the global trading system. ASEAN+3 economies are amongst the most open, and have over the past two decades, benefited from growing global and regional trade integration. Any setbacks to the rules-based international trade regime will have negative effects on regional value chains, business confidence, and prospects for future investment in the region. 7. Looking at the region’s long term fundamentals, they remain intact. The favorable outlook is buttressed by mutually reinforcing fundamentals, such as growing middle class, rapid urbanisation and adoption of digital technology, as well as improved macroeconomic management, amongst others. Considering that the global trade conflict is likely to be persistent, to what extent it will alter regional supply chains and investment decision? Is the region better position to deal with the short term ramifications, while taking advantage of the longer term opportunities? 8. In addition to the external challenges, let us not forget the structural forces that are shaping the future of our economies that also underlie our theme today. One key emerging trend is the proliferation of digital technology and automation, which is not only pervasive and deepening, but also creates much anxiety. The digital transformation is already leading to important sectoral shifts in GDP and disruptive change in employment patterns. The digital era also brings the risks of cyber-attacks, which should not be underestimated. Such cyber-attacks can have far-reaching systemic impact, especially in the area of finance. 9. As these global trends transform the regional landscape and alter the nature of cross-border economic transactions and risks propagation, policymakers should continue to remain vigilant, with no room for complacency. 10. The experience of the Asian Financial Crisis 20 years ago, and more recent crisis experience in other regions, has shown that volatility shocks from global financial markets have become more frequent. During the last decade, ASEAN+3 members have put concerted efforts to improve the size, scope, and capabilities of the CMIM to support regional financial stability. However, building a robust regional safety net is a long-term project. The ASEAN+3 region should continue undertaking pre-emptive measures and work together to enhance the regional financing arrangement in anticipation of possible future crises. 11. I look forward to joining a stimulating discussion with you. Thank you. BUSAN, KOREA, December 12, 2018 – Increasing trade protectionism, tightening financing conditions, and the new technological revolution have posed growing risks and challenges to the ASEAN+3 region. To address these risks, appropriate policy measures should be undertaken and the regional financial safety net centered around the Chiang Mai Initiative Multilateralisation (CMIM) should be enhanced. These issues were discussed today at the ASEAN+3 Financial Forum (ATFF) 2018 with the theme “Voyage in Growing Uncertainties”, organized by the ASEAN+3 Macroeconomic Research Office (AMRO). The forum was held back to back with the ASEAN+3 Finance and Central Bank Deputies’ Meeting in Busan, Korea. As the Co-chairs of AMRO’s Executive Committee for 2018, Mr. Weon-Kyoung Jo, Director General for G20, IMF and ASEAN+3, International Finance Bureau, Ministry of Economy and Finance, Korea, and Mr. Ping Yi YEE, Deputy Secretary (Planning), Ministry of Finance of Singapore, delivered keynote addresses at the forum. Discussants and speakers included high-level policy makers, renowned academics and economists who have strong background and experience on the East Asia region. In the first session moderated by AMRO Chief Economist Dr Hoe Ee Khor, panelists discussed how economies in the region should respond to the increasing global economic uncertainties and disruptive changes brought about by digital technology and automation. The panelists agreed that going into 2019, external risks to the region from U.S. China trade conflicts and tighter global financial conditions remain elevated, and the region should be vigilant. While AMRO has maintained its 2018 growth estimate for the region at 5.4 percent, it has shaded down its baseline growth forecast for 2019 to 5.1 percent, with a significant downside risk. Estimates by AMRO of the impact of the U.S.-China trade conflicts show that regional growth could be reduced by 0.1 to 0.3 percentage point in a baseline scenario and by as much as 0.2 to 1.0 percentage point in a worst case scenario assuming a further escalation of the trade conflict. 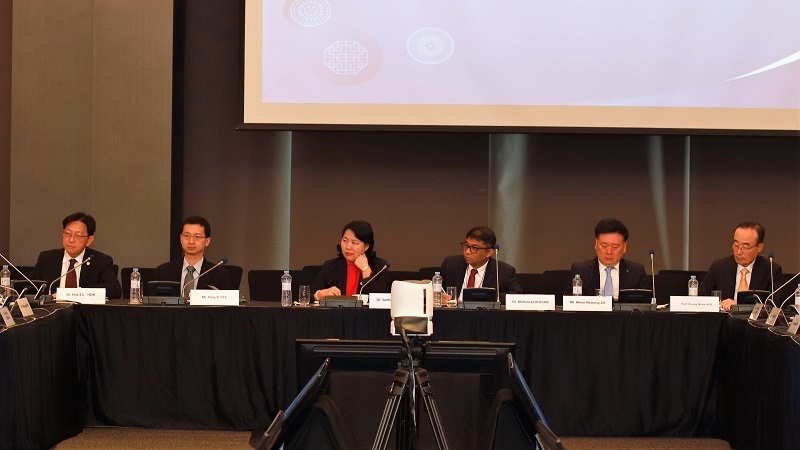 The panelists noted that while the region has benefited from capital inflows, emerging markets that rely on external financing would face increased debt servicing burdens as financing conditions tighten, and risks of large capital outflows. They also discussed challenges to regional economies from new technologies of robotics, automation, digitization, and internet of things, which can lead to disruptions in the traditional business models and job markets. .
To address these risks and challenges, the panelists emphasized the need to remain vigilant, with no room for complacency. Policy measures should continue to be pre-emptive, frontloaded and ahead-of-the-curve. The appropriate policy mix of monetary, fiscal, macroprudential, and structural policies will have to be calibrated according to the circumstances of each individual economy. Panelists were also of the view that the region should embrace the new technologies in order to remain competitive and move up the value chain but to put in place measures to mitigate the disruption to businesses and workers. Moderated by Professor Kyung Wook Hur, Former AMRO Advisory Panel Member, the second session discussed the future of ASEAN+3 regional financial cooperation. Panelists exchanged views on possible future directions of the CMIM with reference to its comparator regional financing arrangements, such as the European Stability Mechanism or the Latin American Reserve Fund (FLAR). They noted that a more predictable funding mechanism would boost regional financing arrangements’ contribution to the financial stability in the region. Closer coordination with other layers of global financial safety net, especially the IMF was also suggested for the future development of the CMIM. An important initiative of AMRO, the ATFF acts as a flagship platform for ASEAN+3 Deputies, academics and high-level representatives of international financial institutions to brainstorm on challenges and issues relevant to regional economic and financial cooperation. The 2018 ASEAN+3 Financial Forum (ATFF) is attended by high-level policy makers, renowned academics, and experts who have strong background and experience on global and regional economic issues. AMRO Director Dr Junhong Chang delivers the opening remarks at the 2018 ASEAN+3 Financial Forum. 2018 ATFF chair table. From left to right: Dr Hoe Ee Khor, Mr Ping Yi Yee, Dr Junhong Chang, Dr. Mohamad Ikhsan, Mr. Weon-Kyoung Jo, and Professor Kyung Wook Hur. AMRO senior management team, Finance and Central Bank Deputies and distinguished speakers and participants at the 2018 ASEAN+3 Financial Forum (ATFF).